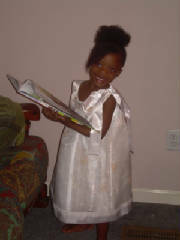 When ordering the pillowcase dresses, please remeber to measure your little one from shoulder to desired dress length and include measurements w/order! 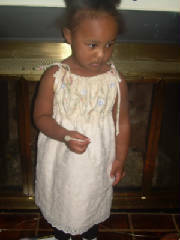 Custom handmade Girls Vintage Style Tea Stained/Dyed Pillowcase Dress w/layers of natural colored eyelet lace bubble ruffles on muslin cotton fabric and spaghetti straps shoulder ties. Please measure your child from top of shoulder to desired dress length. 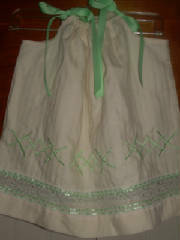 Custom handmade by order Girls Vintage Style Pillowcase Dress w/green ivory cotton gabric patches and ruffled natural ivory eyelet lace. Ivory lace trimmed with green on hem w/eyelet lace underneath. Spaghetti straps shoulder ties. 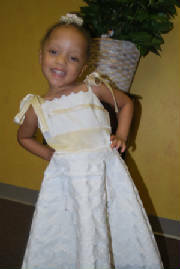 Custom handmade by Order Girls Ivory/Natural Floral Pillowcase Dress with layers of flat ivory/cream eyelet lace. Custom handmade by order Girls White Floral Vintage Style Pillowcase Dress layers of ruffled white eyelet lace. Spaghetti straps shoulder ties. 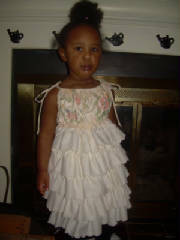 White Floral bodice can be changed to colors of your choice to match white eyelet ruffles. Custom handmade Girls Vintage Style Pillowcase Dress w/plaid patchworkn natural colored eyelet lace on muslin cotton fabric and spaghetti straps shoulder ties. 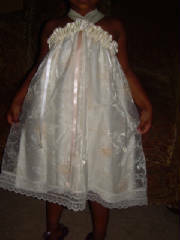 Custom handmade Girls White and Ivory Beach Portrait Vintage Style Pillowcase Dress has narural ivory eyelet lace pocket trimmerd w/ruffled eyelet lace on front and ivory grosgrain ribbon shoulder ties. Custom handmade by Order Girls Beach White Portrait Photo Pillowcase Dress w/rows of Small Tucks & Lace w/Cluny Lace between rows. 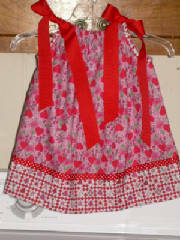 Dress has embroidery design on front bodice & ribbon trim and shoulder ties. Embroidery Designs can be done in any color. 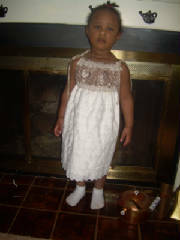 Custom handmade by order Girls Beach White Portrait Photo Pillowcase Dress w/Tucks & Lace. Dress has embroidery design on bodice & ribbon trim shoulder ties. Custom handmade by Order Girls Beach Portrait Photo Ribbon & Lace Rainbow Pillowcase Dress w/shoulder ties. 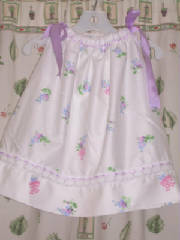 Shabby Chic girls hot pink floral pillowcase dress made with a soft silky fabric and is completely lined. Bodice has elastic w/wide hot pink ribbon and ribbon ties at shoulder. Great for that Special Occasion!! 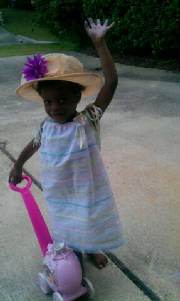 Please measure your little one from arm pit to desired dress length. Bone colored vintage looking pillowcase dress w/antique looking lace at hem, a shorter ruffled antique looking lace between dress and hem and rosey colored designs embroidered above lace on front of dress. 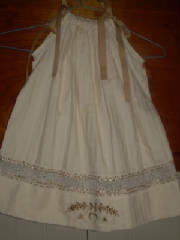 Bone Colored Vintage Looking Pillowcase Dress w/antique looking lace above hem and a light brown design embroidered in hem. 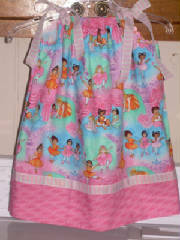 Colorful ballarina pillowcase dress w/contrasting ballarine slippers fabric at hem. Name or initials can be monogrammed on contrasting hem. 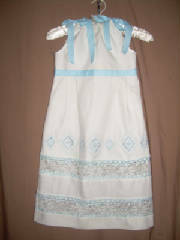 (Dress Only) White Pillowcase Dress with layered embroidered cutworks/battenberg trim. Shoulders are tied w/soft blue grossgrain ribbon. Name or initials can be monogrammed in hem of dress. 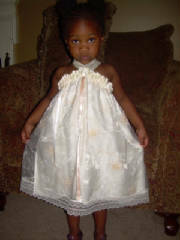 Custom handmade by order girls one shoulder tie dress. Shoulder tie and collar made using white satin and has flowers embroidery. 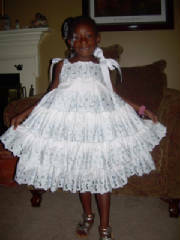 Body of dress is white taffeta with embroidered sheer organza overlay. Shoulder ties, collar and dress under lay can be done in any color. 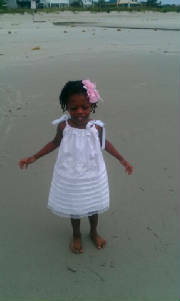 Please measure your little one from top of shouldedr to desired dress length. 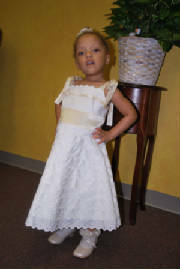 Custom handmade by order girls ivory and champagne dress. Layers of ivory/off white embroidered eyelet mixed with satin champagne fabric. 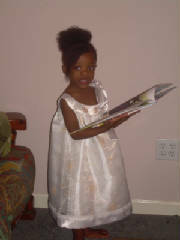 Dress has shoulder ties, back tie sash and back buttons. 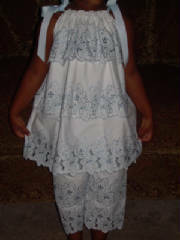 Custom handmade Girls White Pillowcase Dress w/layers of ruffles soft blue cutworks embroidery fabric. 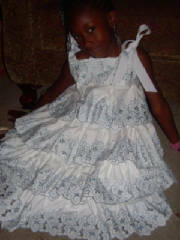 Custom handmade by order Girls Ivoryy Empire Waist Pillowcase Dress w/double rows of lace inset above hem. 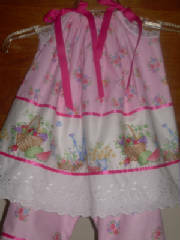 Dress has matching embroidery design, ribbon trim and shoulders. 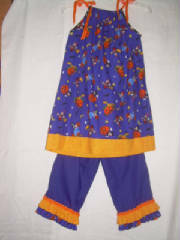 This dress has blue trim but can be done in any color. I also have this lace in white. 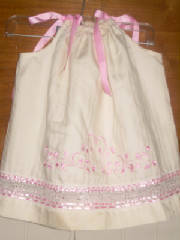 This peaches and creme halter pillowcase dress would look great on your little princess. 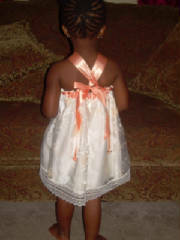 Bodice has elastic w/wide apricot/peach ribbon band and front ribbon that criss cross in back and tie in a bow. 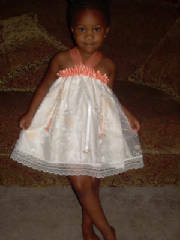 Peaches and creme ribbons hang from bodice around dress w/peach flowers at end of each ribbon. 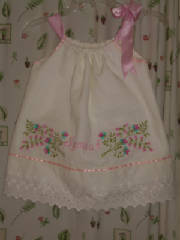 This peaches and creme halter pillowcase dress would look great on your little princess. 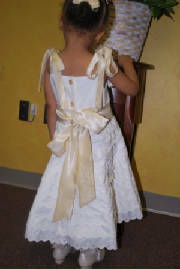 Bodice has elastic w/wide creme ribbon band and front ribbon that criss cross in back and tie in a bow. 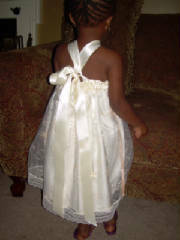 Peaches and creme ribbons hang from bodice around dress w/creme beaded bow at end of each ribbon. 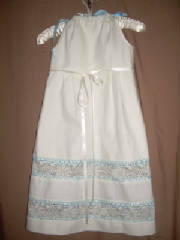 Creme/ivory Pillowcase Dress has an eyelet lace hem and blue ribbon at shoulder that tie on one side. 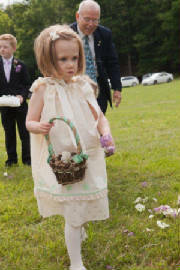 Flowers are embroidered on each side of your little ones name or initials. 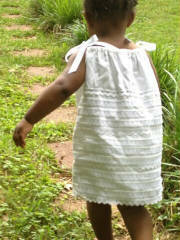 Dress is made with a linen type fabric and completely lined. 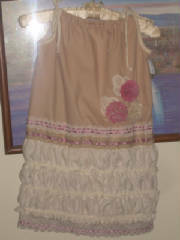 Creme/ivory Pillowcase Dress has an eyelet lace hem and pink ribbon at shoulder that tie on one side. Flowers are embroidered on each side of your little ones name or initials. 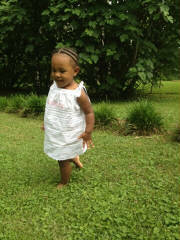 Dress is made with a linen type fabric and completely lined. 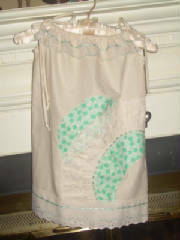 Custom handmade Girls Vintage Looking Pillowcase Dress w/antique looking lace inset above hem w/matching embroidery design, ribbon trim and shoulder ties. 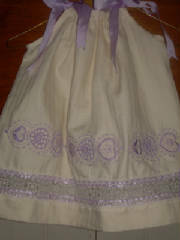 This dress has lavender trim, but can be done in any color. 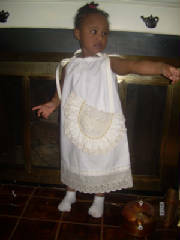 Custom handmade by order Girls Vintage Looking Pillowcase Dress w/antique looking lace inset above hem. 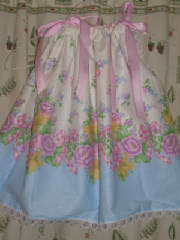 Dress has matching embroidery design, ribbon trim and shoulders. 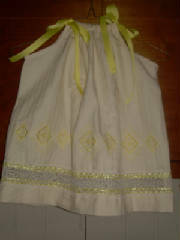 This dress has yellow trim but can be done in any color. 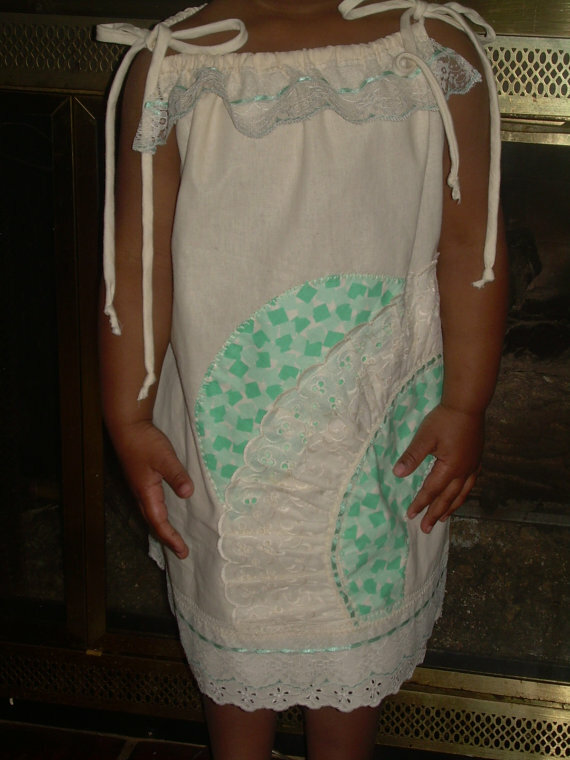 This dress has mint green trim, but can be done in any color. 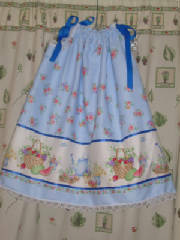 This dress has parakeet blue trim but can be done in any color. This dress has dark peach trim, but can be done in any color. 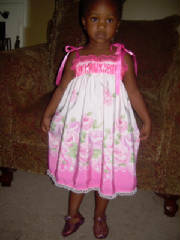 This dress has pink trim but can be done in any color. 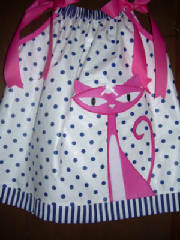 Blue polka dots on an off white background, blue and white stripes at hem. 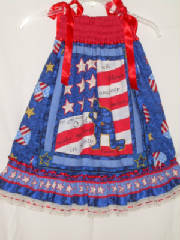 Dress has a dog applique on front of dress. 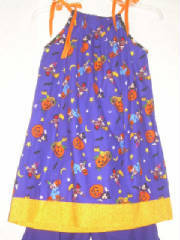 Custom handmade by order girls halloween pillowcase dress has purple flying bats and yellow moon on a black background w/yellow embroidered ruffled hem/border and yellow w/white polka dots ribbon trim. 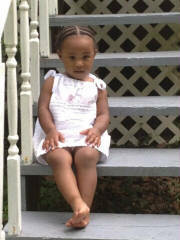 Please measure your little one from top of shoulder to the desired dress length! Thank you for your interest and God Bless! 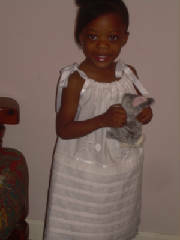 Please measure your little one from top of shoulder to the desired dress length. Pink background w/red hearts & white flowers. Red & white checked border. Name or initials can be monogrammed in hem of dress. 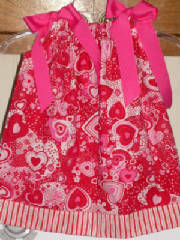 Winnie the Pooh hearts & circles valentines pillowcase dress. Name or initials can be monogrammed in hem of dress. Please measure your little from top of shoulder to the desired dress length. 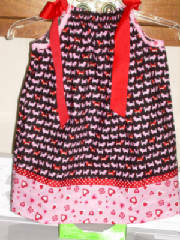 Dachshund Dogs and hearts pillowcase dress. Name or initials can be monogrammed in hem of dress. 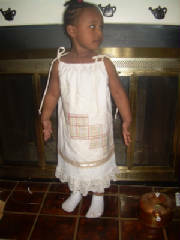 Please measure your little one from to of shoulder to the desired dress length. 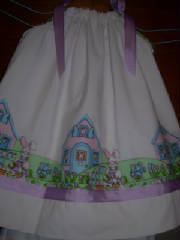 White Pillowcase Dress trimmed w/easter bunnies, eggs, and houses border. Name or Initials can monogrammed on hem/border of dress. 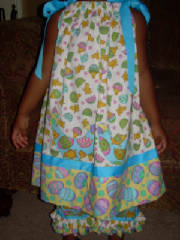 Colorful Egss and Chicks Easter Pillowcase Dress. 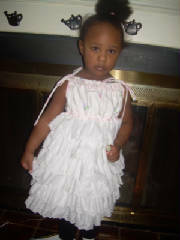 Dress has two chicken appliques on front. 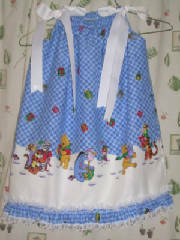 Christmas winnie the pooh pillowcase dress w/white collar w/soft blue cutworks. 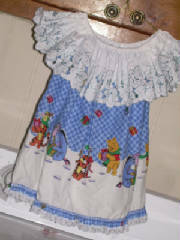 CHRISTMAS WINNIE THE POOH PILLOWCASE DRESS. 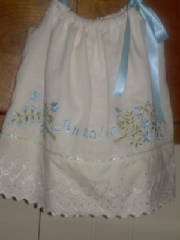 White floral pillowcase dress w/Blue & floral border. White floral pillowcase dress w/white crocheted cluney lace beaded w/lavender ribbon between hem and dress..
Blue floral pillowcase dress w/garden border, for the simple girl. 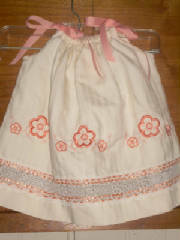 Pink floral pillowcase dress w/garden border, trimmed w/white eyelet lace, for the simple girl. 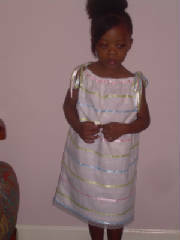 Psalms 4:8, & Psalms 91:11, Pillowcase dress & Purse. 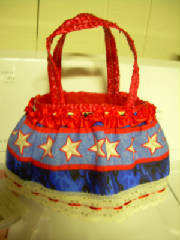 Free name or initials for purse.